Sometimes a single image captures a moment — in a picture, or a snippet of video. Or, more rarely, a scientific chart. Here’s one that sent corners of the Internet into a mild tizzy over the last few days. Despite the spaghetti tangle of lines, it’s a pretty simple chart. What it shows is the total area of global sea ice, as measured by satellites dating back to 1979. The red line at the bottom is this year, with six weeks still to go. And it’s disturbing, of course, because this year’s line is very different. 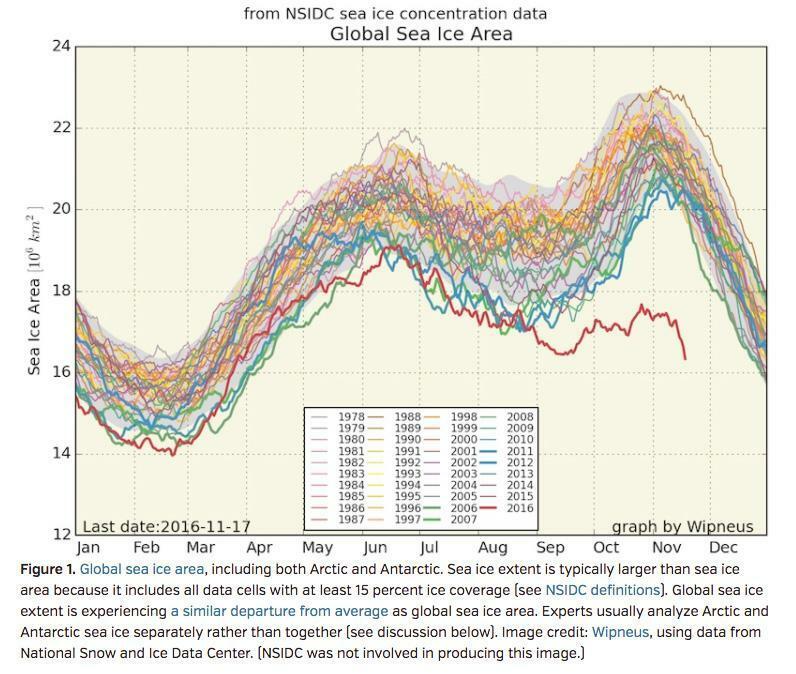 It’s not following the normal pattern — there’s a lot less ice. If you look behind the numbers, you find that the volume of both Arctic and Antarctic sea ice is extremely low for the date — and the fact that it’s happening at both poles is what makes the chart so dramatic. It seems to imply that something very unusual is happening. That something is climate change. 2014 was the warmest year on record, until 2015 came along, and it held the record until, well, 2016, which will officially be certified as the champion in a few weeks. We only have temperature records that go back to the late 19th century, but the scientists who study the proxy records of things like tree rings or coral reefs are pretty confident that this year is the hottest in the 10,000-year history of human civilization. The carbon dioxide and methane we’ve released by burning coal and gas and oil have now raised the temperature more than a full degree Centigrade. 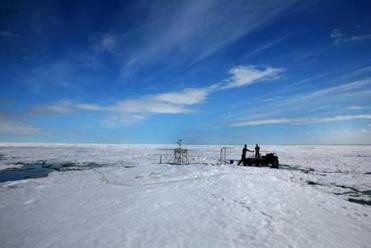 Sea ice hits record lows at both poles. What does it mean? It’s the first time scientists have tracked record low ice levels around each pole simultaneously. Which may well have taken us past certain thresholds. Arctic sea ice has been dwindling for decades now — we’ve lost areas of summer ice measured in units like Texas and Alaska. In the Antarctic, for a variety of complicated reasons, sea ice has risen and fallen dramatically, but last spring researchers said the great ice sheets of the frozen continent had reached a tipping point and that the slide of much of that ice into the ocean was now irreversible, with profound consequences for the sea level in coastal cities like, oh, Boston. But it’s the combination of the meteorological with the political that really captured people’s attention, I think. In the weeks after the shocking presidential election, it felt as if everything had changed, even if not that much had really shifted yet. That profound uneasiness — in some cases even among people who had voted for Trump on the theory that he’d shake things up — makes the mounting evidence of climate change feel even more dangerous. Because all of a sudden our leaders are not even paying lip service to the looming crisis that anyone with a smidgen of scientific knowledge can clearly see. In the Obama years we may not have done a great deal about climate change, but our government said the right words, and reached modest agreements, like the one in Paris a year ago, that set us on a new trajectory. Not, it must be said, a trajectory steep enough to solve the problem, but there was something soothing about the fact that we were taking action at all. Now that balm is gone. We’re confronted, in Mr. Trump, with a man who holds his unscientific views with no apparent hesitation or qualm. In his version of reality, climate change is BS invented by the Chinese; his appointees to key offices have expressed the same views. And so the small comfort of even small action is gone. No one is going to be fooled by Tuesday’s assertion that he has “an open mind’’ about climate change, because even as he said that it, he’s filling his cabinet with the designated picks of the fossil fuel industry. Those of us who value the future must, of course, continue to push as hard as we can. Increasingly we’ll place our hopes in state and local action, and in trying to cajole or force corporations to act where government won’t: Efforts like the one to get Bay State lawmakers to divest the Commonwealth’s holdings from fossil fuel companies have never been more important. But there’s no denying the clarity this moment provides, the picture of our possible and even likely future. Charts like the one accompanying this column (and there are thousands, on every topic from drought to flood to ocean acidification) seem even starker now. We really are living in a new world. Bill McKibben is founder of the climate campaign 350.org, and the Schumann Distinguished Scholar in Environmental Studies at Middlebury College.